For this weekend's LA Cupcakes MeetUp the gang and I went back up to Studio City, well North Hollywood according to their website for some Famous Cupcakes, literally that's their name. Made with organic and all natural ingredients their cupcakes are $3.25 each and come in eight different flavors. Their Hot Chocolate Cupcake (chocolate bottom, vanilla icing) was quite moist and my favorite pick for this shop with their gooey Red Velvet in a close second, the other girls also liked their Peanut Butter Chip and Cookies N Cream cupcakes. Their Va-Va-Va-Nilla though wasn't sweet enough for me, maybe because it's organic and not full of the bad but yummy stuff I guess; it also had a hint of cinnamon and was more like a muffin than a cupcake. The store was very minimalist with funky Pinkberry-like lights. The highlight for this shop though is that they make adorable but expensive famous cupcake bouquets that mix in decorations and flowers along with arranged cupcakes. They deliver to all 50 states and you can also order online. 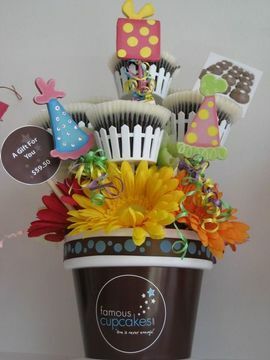 Since Famous Cupcakes is a franchise, you'll probably start seeing them pop up all over, they are currently in OC, Chicago and San Diego and coming soon to Houston. Before having cupcakes this little piggy had a lovely brunch at Cravings in West Hollywood with celeb bloggers PopBytes, CandyKirby and NinjaDude. cupcakes are taking over the WORLD! yay. Wow! Far better than the cupcakes we had! That cupcake looks incredible - the amount of decoration on a tiny surface area! 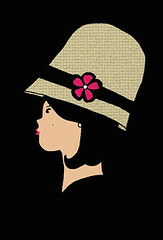 i love your blog... especially love the design! Did u design this template? Sweet! I'm pretty devastated that I wasn't aware of this cupcake meetup when I was in L.A. damnit, now I'm in NYC and want to go out to magnolia RIGHT NOW. Cupcakes my the world a better place. This cupcake is too pretty to eat. Perhaps framing it would last longer. Nice! I've never had their cupcakes but I know Sprinkles Cupcakes are the bomb! Except when looking at the line to get in the damn place, you'd think it was a night club.